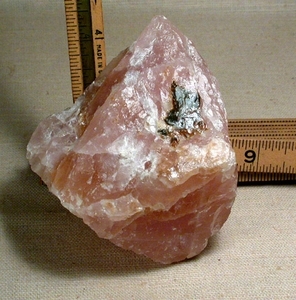 3-3/4x 2-1/2x 3-1/4" tall gleaming peach to pink South Dakota rose quartz rough has glassy floral shaped iron inclusions, several vivid rainbows, and a beguilingly matte area of regrowth. Self displays several ways - sits comfortably in the hand, too. Sent gift boxed with handwritten description. Shipping will be added.